House Oversight Report on the broken FOIA process. 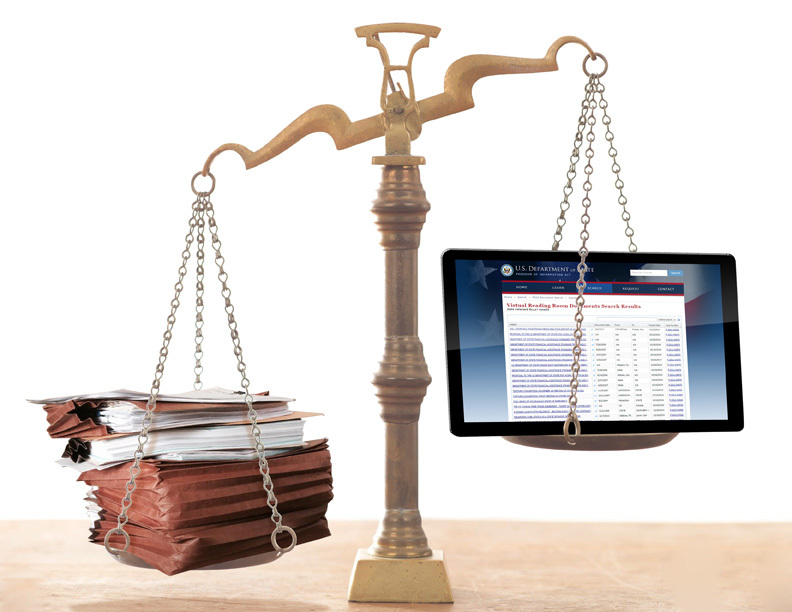 The Archive’s 2015 Audit shows most agencies falling short on mandate for online records. It’s worth noting that the Department of Justice’s Office of Information Policy (OIP), which oversees government-wide FOIA compliance, issued guidance in March 2015 on proactive posting of frequently requested records – defined as those which have been released three or more times. The guidance says, “even in the absence of multiple requests for the same or similar records, agencies should use their best judgment at the time each request is received to determine whether they believe the responsive records concern a popular topic that is likely to become the subject of subsequent requests in the future.” This guidance has been on the books for the better part of a year, so while legislation codifying it is undoubtedly good, agencies proactively post records infrequently and an oversight mechanism to enforce compliance remains necessary. While the House bill is a good step in the right direction, last-minute carve-outs for the frequently FOIA-ed 17 agencies that make up the Intelligence Community from the bill’s improvements are troubling.1 Added at the insistence of the House Permanent Select Committee on Intelligence (HSPCI), the carve-outs exempt the Intelligence Community (IC) from certain provisions, including “language that states that currently-protected information relating to ‘sources and methods’ would not be subject to disclosure under any of the amendments in the bill”. The bill exempts the IC from necessary reforms to the consultation process; a big mistake as intelligence agencies are the biggest consultation abusers. The bill also contains a provision requiring agencies to publish “a list” of of all denied material unless the disclosure is prohibited by law. This is another tremendously beneficial provision of the bill, but it will be watered-down if the IC is exempted. FOIA reform now moves to the Senate, where passage of similar FOIA reform (S 337) seems likely. Majority Whip John Cornyn (R – Texas) urged his chamber to take up the legislation, noting “this presumptive notion of openness is important to the functioning of our democratic form of government.” If a FOIA bill passes the Senate, the difference between the bills will need to be reconciled. This reconciliation is how the two unanimously supported FOIA bills died in late 2014. FOIA was most recently amended by the 2007 Open Government Act, which broadened the definition of “a representative of the news media” to include electronic-only media and freelancers, established the FOIA ombuds OGIS, and prevents agencies from charging certain fees if they miss their response deadlines. Since then, FOIA reform has been introduced six times without becoming law. The House also passed a bill this week to improve disclosure of donations over $200 to presidential library foundations. Chaffetz, left, told Pustay, right, that she lives in “la-la-land” if she thinks FOIA is working. DOJ OIP director Melanie Pustay – who Rep. Chaffetz told in June must be living in “la-la-land” if she thought FOIA was being properly implemented – recently gave another head-scratching quote. 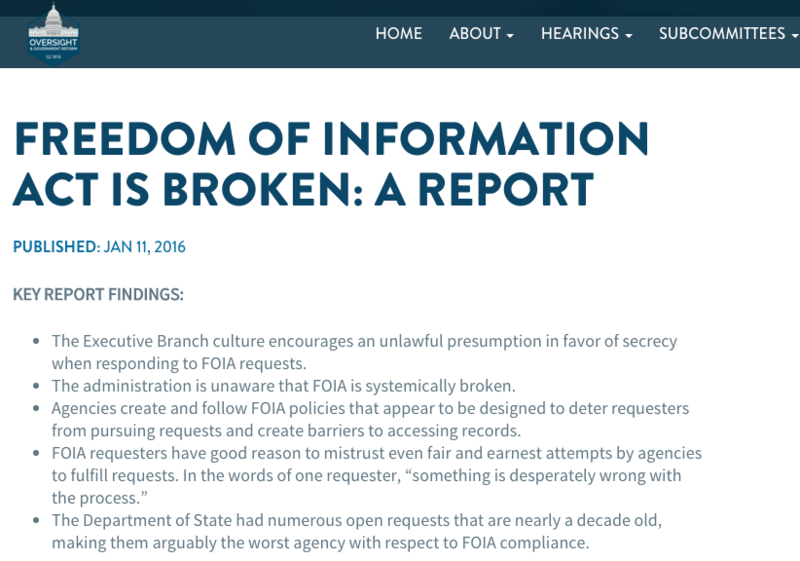 In a truly excellent Nieman Report on “Fifty Years of 50,” Pustay professed ignorance of why FOIA requesters are increasingly frustrated with growing backlogs and bogus use of exemptions. Pustay says, “I’m always perplexed by those sorts of criticisms.”Pustay claims that since her tenure began in 2007, “agencies have outright rejected only 9 percent of FOIA requests”. This figure is highly misleading, and does not include the FOIA requests that it denies based on reasons including: fees (pricing requesters out); referrals (passing the request off to another agency while the requester still waits); “no records” (very frequently the result of inadequate searchers by DOJ employees); and requests “improper for other reasons” (which ostensibly includes the “can neither confirm nor deny” glomar exemption). The figure cited by Pustay also includes records that have been released in part – a misleading categorization when “in part” can mean 99 percent of a document is withheld. Pustay’s off-base comments are further proof that better FOIA oversight mechanisms are needed. 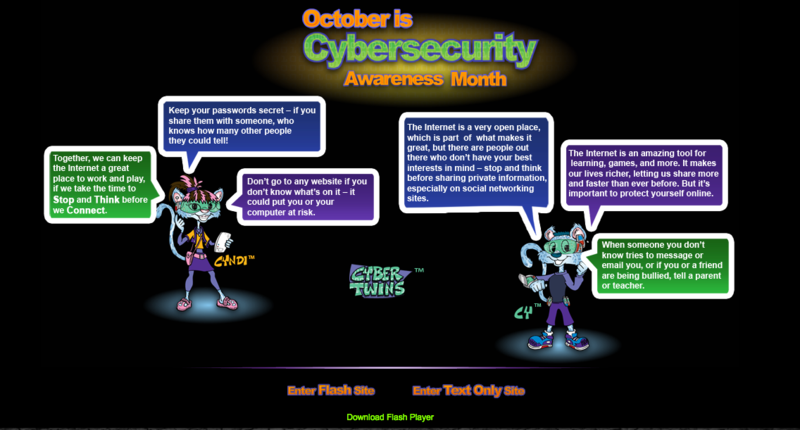 The NSA outdated CryptoKids site. The Supreme Court declined hearing a petition for certiorari in EPIC’s FOIA lawsuit against the Department of Homeland Security for information on its “wireless kill-switch”. This means the U.S. Court of Appeals for the D.C. Circuit’s August 2015 ruling that DHS can “withhold releasing substantially all of a secret protocol that governs the shutdown of wireless networks in emergencies” stands. Today is the last day to fill out the National Security Archive and the Project on Government Oversight’s FOIA fees survey. Please make sure to fill it out and help us provide a more representative view of FOIA fees for the government’s FOIA Advisory Committee, which recently distributed a similar survey – but only to federal FOIA processors. The results will be analyzed before the Committee’s next meeting, to be held on January 19. This week’s #tbt pick is inspired with the NSA’s CryptoKids in mind, and is the CIA’s Osama bin Laden doll, codenamed “Devil Eyes”. 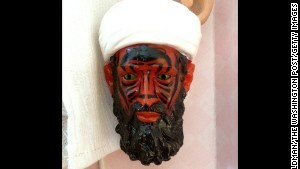 The CIA has not yet responded to the Archive’s 2014 FOIA request for information on the doll – intended for distribution in Afghanistan or Pakistan and whose face was designed to frighten children and painted with “a heat-dissolving material, designed to peel off and reveal a red-faced bin Laden who looked like a demon, with piercing green eyes and black facial markings” – but a copy was was auctioned off by the Nate D. Sanders auction house in June. 1. The agencies that make up the IC are: The Department of Homeland Security; the Department of State; Air Force Intelligence; Army Intelligence; the Central Intelligence Agency; Coast Guard Intelligence; the Defense Intelligence Agency; the Department of Energy; the Department of the Treasury; the Drug Enforcement Administration; the Federal Bureau of Investigation; Marine Corps Intelligence; the National Geospatial-Intelligence Agency; the National Reconnaissance Office; the National Security Agency; Navy Intelligence; and the Office of the Director of National Intelligence.